One of our favorite manual citrus press’s on the market is the Ra Chand J210 orange juice machine. This is an underdog as it has not received much attention on the market such as other bigger brands like such as the black and decker or the Juiceman juicer models. However, despite that the Ra Chand juicer works like a charm and here are a few important pointers as to why this might just make your next favorite manual orange juicing machine. Many of us may not have heard of this brand in the first place however the ra chand line has been making a huge footprint in the citrus press game in the past year. The company launched in the early 2,000’s and has been producing heavy-duty citrus presses, lemon presses, and tortilla presses. Originally they started as a small grassroots company and soon expanded to a full-blown wholesale establishment. One of their primary forte’s at the moment are restaurant grade orange juice presses. We all love a glass of fresh squeezed orange juice, and here is why we recommend you take a step back, relax, and give this orange press a chance. You won’t regret it! The manual ra chand citrus juicer is made out of heavy duty all metal free material which makes it a great juicer that won’t give you any metallic taste when squeezing your orange juice. The metal works on the body of the squeezer is solid and hefty giving it a strong body to hold down long squeezing sessions as well as to give it a nice vintage look and touch in your kitchen. This is really important as many people who go into the manual orange squeezer market not only look for performance but they also look for a great metal works piece to have in the kitchen for looks. In terms of looks combined with performance the Ra Chand juicer has it both. The machine is very versatile when it comes to actually squeeze the oranges, lemons, limes, and even grapefruits. The press has a spring loaded lever press which makes the juicing extremely fast, easy, and efficient. If you have used a manual orange juice machine before you will know how difficult it is to have a press that is not spring loaded. Many presses on the market actually have a non-spring press which causes juicing to be more difficult on the user’s arm as well as making it slower during the juicing process. If we look at the size of the juicer you are looking at an extended arm height of 26.5 inches, a body height of 16 inches, a width of 7 inches, and a depth of 11 inches. All through the piece looks heavy and hefty it weighs only seven pounds and five ounces making it easy to move and maneuver around. Let’s take a look at some of the Pros and the Cons of the juicer to see if it is worth the investment. First and foremost if you are looking for a heavy duty reliable orange juicing machine for the home the ra chand j210 juicer is definitely the way to go. Not only is it sturdy and made out of a tough metal design but it has longevity. When we review orange juicing machines we look for the quality of juice as well as how long a machine can potentially last, and this is one of those that you may potentially hand down to your grandchildren. When you order it from Amazon you are getting a great deal as it comes in metal-free shipping. This means that the shipping cost on the unit will be cheaper than if you were to buy any other machine in the same price range. Many juicing machines out there tend to charge a lot on shipping due to their size and weight, however, Ra Chand does a good job in cutting these costs for buyers to have it easier when placing an order. The amount of moving parts on the manual orange juicer is limited which means less chance of you breaking it or misplacing parts. This makes it easy for you to have it cleaned and prepared for your next juicing session. 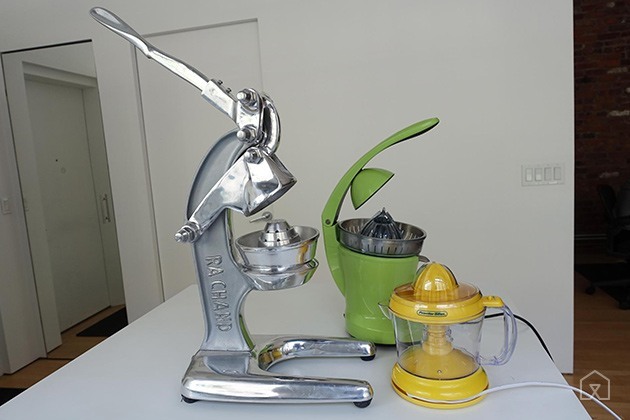 For example with other juicers we have tested primarily from the electric citrus segment tend to have a lot of different moving parts that you need to dismantle and wash. This makes it very difficult for the user to have consistency while juicing as the parts can vary and may require too much cleaning. 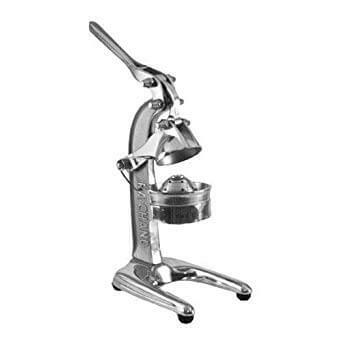 However, with the innovative heavy duty design of this citrus press, you really don’t have to worry. A quick wash will be more than enough and your machine is ready to go! The juicer is completely manual and designed primarily for citrus fruits, made out of cast heavy aluminum. Works with a variety of citrus fruits from limes, oranges, medium grapefruits, and also allows for juicing pomegranates. A spring-loaded lever action which gives firm and precise pressure to the fruit which is being juiced for maximum juicing. A cone-shaped reamer which allows for filtering out pits which make it easy to clean and to extract and extra leftovers. Allows for a 6-inch high glass. The only downside we were really presented with when testing this manual orange squeezer out was the fact that it could not accommodate larger grapefruit. However many people who look into this machine are probably not into squeezing grapefruits as much as they are into squeezing oranges. Overall if you are looking for a manual orange squeezer machine that has a great vintage build and also an effective and smooth juicing process. We would definitely recommend the ra chand citrus juicer. In our opinion, it works very similarly to a Juiceman juicer however it is a bit smaller in the build. Other than that the heavy duty looks as well as spring action lever allows for a firm and strong juice. At this point, it comes down to personal preference and what you see yourself doing with the ra chand j210 juicer machine.